Congratulations to the winner of the Unlimited Romance Pinterest Contest – Eva Thompson! She will enjoy a 3-night Unlimited-Luxury® stay at a participating resort. 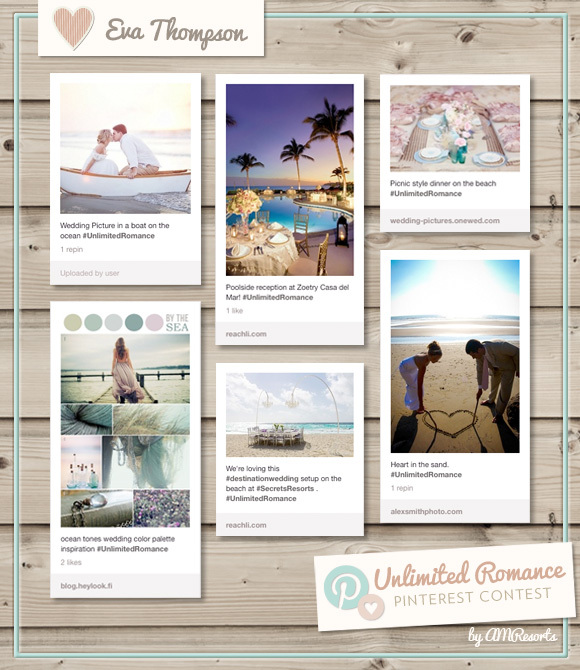 Be inspired by Eva’s winning Unlimited Romance board by clicking here. Thanks to everyone who participated, all of the boards submitted were so creative and of course romantic. Continue to be inspired by real weddings that take place at Secrets Resorts & Spas on www.UnlimitedRomance.com. Stay tuned for a new wedding promotion being launched this spring!